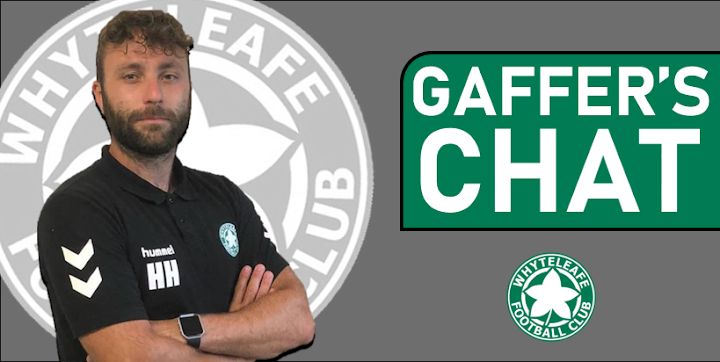 Whyteleafe FC fan and motoring journalist, Steve Hole, ditches the tea this week and has a civilised cup of posh coffee with Leafe manager, Harry Hudson, to get his thoughts and views on happenings at The Leafe, over the last seven days. After a couple of tough weeks, this time Harry reflects on the away draw at VCD Athletic and the superb home win to Hastings on Tuesday, which Leafe back up to fifth in the Bostik League South East table. He also previews the upcoming home league fixture this Saturday (December 1 – 3pm – Church Road), when we entertain Faversham Town. Oh and Harry also reveals that he is a Spurs fan! Each week Harry will bring us his thoughts and important team news, the ins, the outs, and the highs and lows. Harry, marvellous win on Tuesday evening against an up and at ‘em Hastings side. You must be well-pleased after that one? To use a footie cliché ‘the boys done good’!? Yes, delighted with the result on Tuesday evening and the approach of our players to adapt to a different game plan. The performance wasn't a typical Leafe one by any means, but it was incredibly important that we secured 3 points. After our recent 'blip' we questioned the group and challenged them to get back to the approach that yielded success for us at the start of the season and they have passed with flying colours. Hastings are a good side but whatever system you implement in football will have its strengths and weaknesses and we asked the boys to play in a way which we felt exposed Hastings weaknesses and thankfully it worked. The sending off, of their player, and subsequent conversion of the free kick, by Brad Wilson, is absolutely huge in the context of the game. However, second half Tyler didn't have to make a save and we have missed two 1-on-1 opportunities and hit the inside of the post. Some fans among the 147 hardy souls who braved the horrible weather reckon that was our best win of the season. Agree with that? I think it is certainly up there but for different reasons. People will say that we should have been more aggressive defensively against ten men but my answer would be 'why change something that is working?' That would be purely arrogance due to the numerical advantage; the reason we had more chances later on in the game is because Hastings had to push forward more and more, which created even bigger spaces. I am really pleased that the home fans got the performance and result last night after a difficult couple of weeks - thank you for your continued support! Especially pleasing after the minor blip against Hayward’s Heath and Sevenoaks? Most certainly and it was important we responded well against VCD and Hastings - it is a very long season but you do not want to be playing catch up. We are back in the play-off positions and we have to keep ourselves there now! You seemed to have a game plan that worked beautifully. It must also be satisfying when something like that goes like clockwork? Yes, it is very pleasing, especially after we questioned the team for not following instructions against Sevenoaks. The players deserve all the credit though - any tactical plan can be great on a presentation or tactics board but the skill is in the implementation. Additionally, as mentioned above, the key point in the game went in our favour. When you have a game plan like we did you need to not go behind and ideally score first - we did that and they went down to ten men in the process! We’ve skipped over last Saturday’s away nil-nil to VCD Athletic, where we did everything bar score the winner, despite young Bryan Akongo going oh so close with a header. Were you happy with that performance? I thought it was a very open game when both teams had chances to win. VCD were better in the first half but I thought we improved in the second period and when they finally went down to ten men, Akongo missed that huge chance which probably kills them off. As we saw against Hastings though, if you can capitalise on an extra player early the game changes. I then do not believe the red card is right (substitute Akongo got sent off) and that the referee has just evened the game up and in the end either team could have nicked it. I must highlight our goalie Tyler McCarthy though who was exceptional throughout the game and was comfortably my man of the match. I suppose it speaks volumes that both teams had chances and I am still not quite sure how it ended 0-0. It was important for us to not lose that game though and to not go into the Hastings match needing a win off the back of three defeats. Time to get a bit random I think, Harry. A couple of fans have asked me to find out a bit more about your thoughts on football in general…I’ll stick one of these in each week if you don’t mind? Who is the football manager/coach that you most admire and why? No problem! I am a Spurs fan so I admire Pochettino and the job he has done at Tottenham. I enjoy his energetic, high intensity style of football and the way he works hard with young players. Obviously, Pep is extraordinary and is an absolute genius who has changed football, in my opinion. I do really respect how Poch tweaks with intricacies to adapt to specific games, though - I believe in teams being tactically varied. Pep maybe doesn't need to do so as much because he has the resources and players to perfect one game model. How’s it looking for this Saturday’s game at Church Road (December 1 - 3pm) when we entertain Faversham Town? They’ve had a mixed season as far as results are concerned, but they have chucked in a few good ones, so shouldn’t be underestimated, right? No not at all and we have to learn from Sevenoaks and Haywards Heath. Faversham have recently changed management and secured a draw against Hastings on Saturday. They are a physical side who will pose a very different threat to Hastings that we have to be prepared for. They also have what several people reckon is the division’s best goalkeeper in Billy Godman? However, several others, me included, reckon that our Tyler is playing out of his skin and must be right up there? A couple of his stops against VCD on Saturday were top drawer... I am not sure about their keeper but hopefully we really test him on Saturday! I could not be happier with Tyler and in my opinion I wouldn't swap him for anything I have seen all season including teams in leagues above us. Any injuries to report for Saturday? Daniel Hector is struggling with an ankle injury, which has kept him out of the last two matches - it will be touch and go for Saturday, to be honest.